If you care about the animals and value their lives, you’re not alone. Caring about animals has never been more popular in America. For instance, a study published in the Congressional Quarterly found that two thirds of Americans believe that an animal has a right to live free of suffering. In addition, a third of Americans are worried that existing laws are inadequate to protect animals. That same concern has also been contributing to the rise of mainstream friendly animal welfare organizations. For instance the Humane Society of the United States now boasts over 11 million members. Recently, the growing concern has also become translated into legislation. A measure that, by 2015, bans farmers from raising egg-laying hens, veal calves, and pregnant pigs in overcrowded cages and crates so small that the poor animal can not even turn around, has passed in California by a substantial majority. Florida, Arizona, Colorado and Oregon have passed similar laws for pigs and veal calves. Fearing a massive victory in an Ohio voter initiative, the state’s farmers have voluntarily agreed to humane reforms. And just in the past few months, an historic national agreement was reached between HSUS and the chicken industry. Chickens across the country will finally get some federal protection under new legislation, which proposes phasing in cages that give hens up to 144 square inches of space each, compared with the 67 square inches that most hens have today. It would also mandate more humane slaughter methods, along with other improvements. Backed by both the Humane Society and the chicken industry, which was noticing the public pressure for change, this legislation is likely to pass. So let’s take a look beyond the headlines and see what’s going on. There is a growing confluence of three currents in our society: the increasing public appreciation of and concern for animals, new scientific information confirming the reality of animal suffering along with the healthfulness of vegetarian diets, and religious and moral leaders who advocate extending moral questions to the humane treatment of animals. Farm animals today are forced to live a much harder life than in former times. Most of today’s farm animals are raised on so-called factory farms. Modern factory farms revolve only around efficient, low-cost production, which unfortunately results in harsh conditions and greatly increased suffering for billions of farm animals. Chickens and pigs are packed into overcrowded cages so small that they can’t even turn around. Cows raised for veal are chained up their entire lives. More and more Americans are learning about these inhumane conditions. Exposes and videos showing outrageous abuses in slaughterhouses cause even the most reserved to cringe. Indeed it has often been said that if slaughterhouses had glass walls we would all be vegetarians. In a way, researchers have known this for some time. They have been in the untenable position of testing pain medications on animals while trying to deny that they can feel pain. Over time, many Americans have become suspicious of this kind of double talk when it comes to animal suffering. Author Mathew Scully puts the matter clearly when he says “And how much simpler to drop the pretensions, call cruel things by their name.” The American College of Veterinary Anesthesiologists now bluntly states that animal pain and suffering are clinically important conditions that adversely affect an animal’s quality of life both in the short and long term. 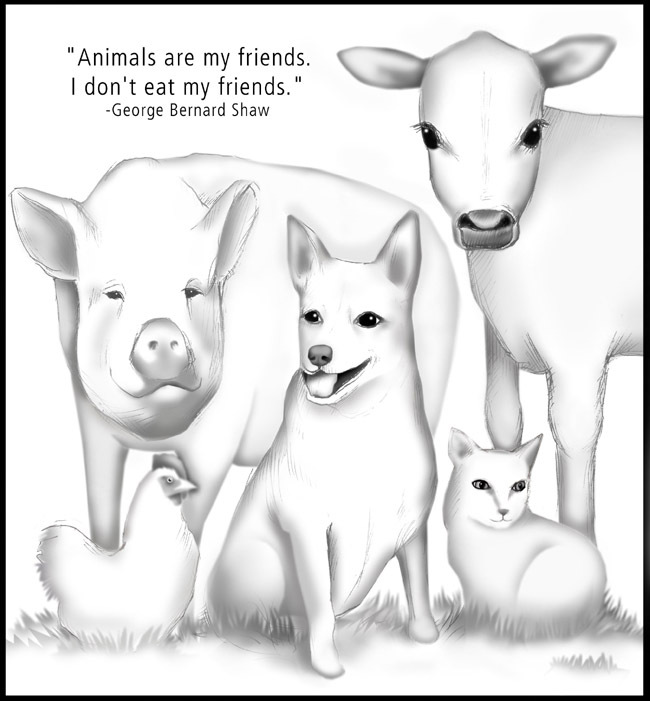 Many religious and moral leaders have long advocated for the compassionate treatment of animals or the vegetarian diet that goes along with it. The list is, perhaps, more extensive than many realize. A short list would include John Wesley (founder of the Methodist Church), Saint Francis, and two Chief Rabbis of Israel. Founding fathers such as William Penn (founder of Pennsylvania) and Thomas Paine (who started the American Revolution) spoke out boldly against cruelty to animals. In more recent times spiritual leaders such Pope John Paul II, Cardinal John Henry Newman, William Booth (founder of the Salvation Army), C.S. Lewis, Albert Einstein, Professor of Theology the Reverend Andrew Linzey, Thomas Merton (a Trappist Monk), Ghandi, Martin Luther King’s wife and oldest son, the Dalai Lama and many more have spoken out to increasingly receptive audiences. The American public reacts against animal suffering, but they have to know about it first. The problem is that they don’t often know about it, or the information is presented to them in a way they find objectionable. Americans have big hearts. More and more will sincerely care, when they find out what happens in today’s factory farms. Those who care are not alone. Every year, more and more people choose a vegetarian diet as a way of expressing their compassion for animals, improving their health or reducing their environmental footprint. If you’re not yet a vegetarian but would like to be, we’re here to help. Try coming to one of our monthly dinners, reading our books, The Vegetarian Solution and Say No to Meat, attending one of our free cooking and nutrition classes and enjoying our two day festival, Vegfest. By making vegetarian food choices, you will be saving farm animals with every bite and maybe, just maybe, the day will come when all the animals will be saved.